I contributed to a UCL book: Future-proofing London in: Bell, S and Paskins, J. (eds.) Imagining the Future City: London 2062. Pp. 73-83. London: Ubiquity Press and spoke about the above at the Future of London/UCL ‘London 2062 – Housing Seminar’ . You can download the book chapter here for free. The chapter is based on Pelsmakers; 'The Environmental Design Pocketbook' and lead to other pieces of writing such as "Living with water: four buildings that will withstand flooding" for The Conversation (Feb 25th 2014). I also wrote another related piece 'REBUILDING OUR CITIES IN A WORLD FACING FLOODING' for The Architectural Review (April 2014); with a shorter printed version 'Apres moi, le deluge' (pdf, page 27). Kevin Hartnett at the Boston Globe (also here) and 'Cities on frontline of climate change struggle' also picked up on the issues raised. There is also a short video interview here by UCL, and the blog below for UCL's Climate Week (2014) and a blog that first appeared at ECOWAN 2012. In England, as many as 5.2 million properties may be at risk of some kind of flooding; that is 1 in 6 (Vardoulakis, 2012). The UK is particularly vulnerable to flooding: as an island it is surrounded by a large body of water and is vulnerable to rising sea-levels and exposed to extreme weather and rainfall events. (e)Other causes such as failing infrastructure or rising ground water. Flood risk is expressed as the likelihood that a flood will occur in a given year. There are four flood zones, ranging from zone 1, the lowest risk, to zone 3b, the highest, as indicated in the diagram above (Fig. 1). Zone 1 is at risk of flood less than once every 1000 years and all development is suitable, while in zone 3a, no ground floor dwellings should be built; and flood zone 3b, which has a flood risk of more than once every 20 years, is effectively a floodplain, so building here should be avoided as this land is used and needed for the storage of excess water when floods do occur, simply to avoid flooding elsewhere. This winter (2013/14) – while not over yet – is already one of the most exceptionally wet in the past 248 years (METOFFICE/CEH, Feb 2014) while in the summer of 2007, more than three times as much rain as normal caused exceptional summer flooding of 55,000 properties and significant damage to infrastructure (Vardoulakis, 2012). Unlike the 2007 summer, during this winter the majority of flooded properties have been those located in floodplains, which exist to act as water storage; and properties in less-dense rural areas. While fewer people and properties have been affected than in 2007, flooding is not only disruptive at an operational level, causing damage and problems to property and infrastructure (water and electricity supply damage and failure), but has significant financial implications and leads to economic losses. The economic cost of infrastructure damage alone in the 2007 floods was estimated at £3.2 billion (Vardoulakis, 2012), while £130 million has already been allocated for emergency repairs and helping those affected during this winter’s floods (CCC, 2014b). And of course it also affects – directly and indirectly - public health: while infectious disease from flooding in the UK is limited, health risks from flooding include hypothermia, accidents and injury, significant stress and mental health impacts from the exposure to dirty, sewage and debris contaminated water and loss of property and having no access to clean water, electricity and heating (Vardoulakis, 2012). Water as shallow as 15cm deep can be threatening to those at risk, particularly the elderly or young, and in some cases even leads to disease and death, with morality rates highest in flash floods (Vardoulakis, 2012). In addition, risk of fungal growth after floods may be increased. Fungal growth affects occupant health (H. Altamirano-Medina, 2009) but this risk reduces with faster drying of a building after flooding (Taylor et al., 2012). Taylor et al. (2012) modelled flooding of properties and reported that drying out times of constructions was accelerated when properties were heated and naturally ventilated (i.e. with windows open). Evenso, drying out still takes ~ 1-3 months for solid wall constructions and much longer where the wall is of newer cavity construction (which is much of post-1930 construction in the UK) and where they are insulated with mineral wool (Taylor et al., 2012). Heating a building with windows open is likely to be expensive and of course will have a significant environmental impact from the high space-heat demand required for the drying out of the structure. In addition, it is unknown how long properties with cavity walls and floor voids from suspended floor constructions and present in much of the UK’s pre-1919 building stock, take to dry out after flood events. Such constructions may be wet for much longer, even if the surfaces may appear dry. Yet fungal spores can be transferred from such voids and cavities to internal spaces (Airaksinen et al., 2004). There is no definitive answer whether these exceptional rainfall events were caused by climate change, due to the variable nature of the UK weather and climate, (METOFFICE/CEH, Feb 2014) but recent events provide a glimpse of what the future holds (CCC, 2014a, Vardoulakis, 2012). increase extreme coastal high water levels in the future as a result from rising sea-levels. Particularly at risk of exceptional floods are South Wales, Northwest Scotland, East Anglia, the Thames Estuary, Yorkshire and Humberside regions (Vardoulakis, 2012). Yet there has been a reduction in staffing and investment in The UK’s flood-risk management (CCC, 2014b) in addition to an increase in building on flood risk areas in England: 12,000 to 16,000 new houses every year in England are built in flood-risk zones, though they may have been built more resilient to flooding (Vardoulakis, 2012). Furthermore, this increased risk is acknowledged by the insurance industry and while risks are increasing, flood-defence cutbacks threaten to make home insurance unaffordable for many (ABI,2009, ABI, 2010, Vardoulakis, 2012). For example, it is usually impossible to insure dwellings located in Flood risk zone 3. So how can we prepare? Historically we have been defending our urban areas from water, but will this still work? After all, defending one area and increasing and/or improving flood barriers and defences may simply move the problem elsewhere, such as lower down in the valley or along the river. We probably need to start thinking about our land differently: can we work with water rather than against it? How do we reduce people living in flood risk areas rather than increase this as more land may become at risk of flooding? And how do we protect people and property already present in flood-prone areas? As a result of present and increased risk, we need to ‘flood-proof’ our buildings, villages and cities. The good news is that while the predicted conditions will be new to the UK, they are already a fact of life for much of the world and building precedents in the Netherlands, which has more than 50% of its landmass below sea-level, could teach us how to adapt our cities and how to work with water, rather than against it. undertake flood risk assessments and build less, not more, in areas at risk of flooding from sea and rivers. This means not building in flood risk Zone 3; and instead managing this land to store water more naturally. increase green spaces, permeable surfaces and urban reservoirs to collect rainwater. This can reduce localised flash flood risk and can provide recreational areas and support local wildlife. design flood resilient buildings: adapt existing building and build new buildings differently to protect and minimise damage to property (and life) and to allow easier repair and drying out in the event of floods. For example we can build new properties on stilts, or floating buildings as they do in the Netherlands. In the UK we tend to built ‘sacrificial ground floors’ with dwellings above a ground floor car park, which can store water in the event of floods without damage to the properties at high level. Additionally, most existing structures can be ‘wet-proofed’, which means they are designed with possible future flooding in mind and result in only minimal damage to the property should this happen. This can be achieved through the use of water-resistant materials for floors, walls and fixtures, and the siting of electrical controls, cables and appliances above 1 meter from the ground. Fig.2. illustrates some of these options. Figure 2. 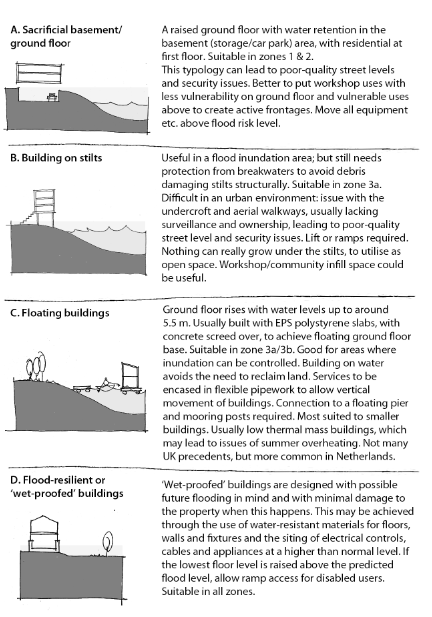 Flood mitigation: building typologies that work with water. Copyright (Pelsmakers, 2012). Whatever the future holds, we cannot afford to be complacent – especially as the measures above, and many more, can and should be easily incorporated into current design, policy and planning procedures. Neglecting to future-proof our buildings will only result in a country ill-adapted to the future needs of our society within a changing local and global environment. Buildings will fail to function effectively under extreme weather conditions leading to increased, wasteful energy use, and exacerbating the effects of global warming. At worst, the inability of our built environment to cater to the demands of its inhabitants might simply result in a stock of obsolete, unhealthy buildings unfit for purpose, while also increasing the necessity for costly and carbon-intensive interventions in years to come. To safeguard our built-environment from extensive damage we need to start designing for these changes right now. With sufficient foresight and planning, we can provide buildings which support climate change mitigation efforts and, when needed in the future, also support the on-going climate change adaptation of our cities for years to come. The above is based on The Environmental Design Pocketbook (2012), Pelsmakers, S., Riba Publishing and Pelsmakers, S. 2013. Future-proofing London. In: Bell, S and Paskins, J. (eds.) Imagining the Future City: London 2062. Pp. 73-83. London: Ubiquity Press, which can be downloaded for free from here. ABI. 2009. Rising global temperatures will put the heat on insurance as flood costs rise [Online]. Available: here [Accessed Feb 27th 2014]. ABI. 2010. Climate Adaptation - Guidance on Insurance Issues for New Developments [Online]. Available: here [Accessed Feb 27th 2014]. AIRAKSINEN, M., PASANEN, P., KURNITSKI, J. & SEPPANEN, O. 2004. Microbial contamination of indoor air due to leakages from crawl space: a field study. Indoor Air, 14, 55-64. CCC. 2014a. Latest post: Climate change and the UK floods [Online]. CCC. Available: http://www.theccc.org.uk/ccc-blog/ [Accessed Feb 27th 2014]. CCC. 2014b. More money for flood defence (repairs) [Online]. CCC. Available: http://www.theccc.org.uk/blog/more-money-for-flood-defence-repairs/ [Accessed Feb 27th 2014]. H. ALTAMIRANO-MEDINA, M. D., I. RIDLEY, D. MUMOVIC AND T. ORESZCZYN 2009. Guidelines to Avoid Mould Growth in Buildings. ADVANCES IN BUILDING ENERGY RESEARCH 3, 221-236. INTERGOVERNMENTAL PANEL ON CLIMATE CHANGE. In: IPCC (ed.). UK and NY. METOFFICE/CEH Feb 2014. The Recent Storms and Floods in the UK. Devon: METOFFICE. PELSMAKERS, S. 2012. The Environmental Design Pocketbook, London, RIBA Publishing. TAYLOR, J., BIDDULPH, P., DAVIES, M., RIDLEY, I., MAVROGIANNI, A., OIKONOMOU, E. & LAI, K. M. 2012. Using building simulation to model the drying of flooded building archetypes. Journal of Building Performance Simulation, 1-22. VARDOULAKIS, S., HEAVISIDE, C. 2012. Health Effects of Climate Change in the UK 2012 - Current evidence, recommendations and research gaps. In: HPA (ed.). Didcot: HPA.